In 1975 Lotus launched a new car at the Paris Motor show after a few years of development from a concept car that was to revolutionise the brand and keep it well within the supercar segment at the time. In fitting with tradition, all Lotus model names start with the letter E, and in 1975 this model was no different and was aptly named an Esprit. This early S1 model replaced the Lotus Europa and was famed for its handling however the lack of power from the 2 litre engine let it down. In 1977 the S1 Esprit made its name on the big screen in the Bond movie “The Spy Who Loved Me” as the “Submarine Car” and took chase from villains on the road before submerging to the ocean during the long action scene. A year later in 1978 the S2 Esprit was launched which enhanced the car with air ducts behind the quarter windows, an integrated spoiler and rear lights from the Rover SD1. The wheels were a specially made Speedline offering in 14inch. For this model they also introduced the 2.2 litre engine which kept the same horsepower of the 2 litre variant but increased the torque. This 2.2 S2 model also used a galvanised chassis and is incredibly rare now as only 88 were ever produced. In 1980 the S2 was replaced with the S3 variant, at this point Lotus ditched the 2 litre engine in favor for the 2.2 litre, and they also added a turbo to this plant to give buyers the option of normally aspirated or forced induction. Inside the S3, a host of changes included revised trim changes, greater headroom and larger foot wells thanks to changes on the body moulds. The turbo model was given slight body enhancements and both models ran with 15″ BBS alloy wheels. This timeline now brings us to the model pictured, an S4 Lotus Esprit; In 1987 designer Peter Stevens (who went on to design the McLaren F1) was brought in to restyle the by now popular British steed. An all new system was drafted in and patented by Lotus to mould the body of which a lot is reinforced with kevlar and this allowed more scope and flair with the shape. On seeing this 1988 Esprit for the first time in a friends garage during a clutch change, I grinned somewhat due to the fact that seeing an S4 Esprit as a child was always one of those “WOW look Daddy a supercar” moments, and it is without doubt a supercar. A supercar to me is a car that is neither comfortable nor conventional, the feeling inside of being “thrown” together and held together with very little, noisy in all aspects and a complete handful to drive. These characteristics are ones that in the eighties made such cars so special, exciting and involving, in fact some Italian supercars I have driven that are no more than 10 years old still have all these characteristics about them. On chatting with Conor the owner of this fabulous example one evening along with Nelson and Simon who look after the mechanicals of the car, we had a great laugh as I raised most of the above issues and yet after all the laughter died down, we agreed that the Esprit wouldn’t be what it is without them and that its one of those iconic cars that most people would love to own and drive, myself included. 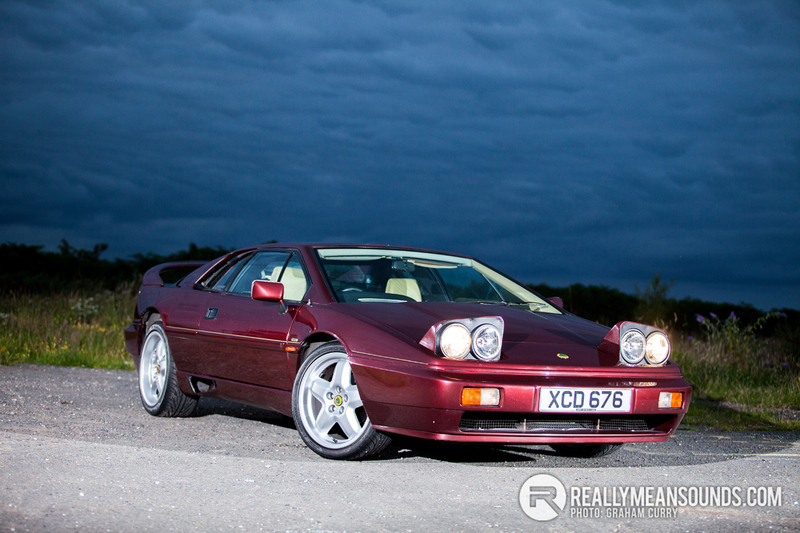 The shape and styling of the Esprit are still in my eyes beautiful and to a non petrol head this Lotus could be any make or model from the finest of Italian factories, this is a grand statement from a car that was built in England in the late eighties. Inside the Esprit is compact; the dash is very square with very little other than cream leather to look at, there was a very funky illuminated Esprit logo in front of the gearstick which was a nice touch though. The seating position was on the floor as expected with such a car and the pedals closer than Siamese twins and offset slightly making them awkward for farmer sized feet. So to finish off; Denim on Denim, Mullet Hair, Ghetto Blasters and Shell Suit Track Suits are all iconic things from the eighties that have thankfully all but died off never to be seen again, and for good reason as only the strong could survive such times and this Lotus Esprit is one of the strong! Famed for its handling, being slightly down on power and a little rugged throughout, but loved by many across the world and for good reason, it’s just one of those cars that will always put a smile on your face be it seeing one drive past, having it sitting in your garage or cruising the lanes on a summers night, this iconic supercar will live forever with pride. Lovely cars, best Lotus bar the Elise :) A friend of mine has one which was bought new in Canada by the family, and barely has delivery miles on it. Good article! I did my mechanical apprenticeship at Harkness Nissan & Lotus in Ballymena from '95-'97 and I was there for the release of the v8 Esprit. I was in awe of the various Lotus models I helped repair for the first few months and slowly began to tire of them because of the poor build quality that Graham mentioned. They were literally built by spare parts bins of various companies with gearboxes from the old Renault 21's, switchgear from Vauxhall's, to lights from Rover and Toyota. We regularly had Elise's in with problems ranging from sticking dump valves to interior trims falling off! They were gorgeous to look at and when they were going they went well, would I own one (in the ideal world were I could afford it), not a chance! It was one of those moments where you meet a childhood hero and are seriously let down by the reality of it, a bit like Ferrari when I worked at Charles hurst, but that's another story!